The term DevSecOps “has always struck me like the last kid getting on the bus and there’s no seat available. We are treating security as an afterthought. Security has never been an afterthought with any customer I dealt with — in financial services or now at Amazon Web Services. I feel like the name doesn’t reflect the importance,” Cronin said. In fact, with the new European regulations of GDPR, she says privacy by design and privacy by default are built right in. “It nearly mandates you should be doing DevSecOps,” she said. So, in the end, what is DevSecOps to Cronin? Security automation as a priority early and often. 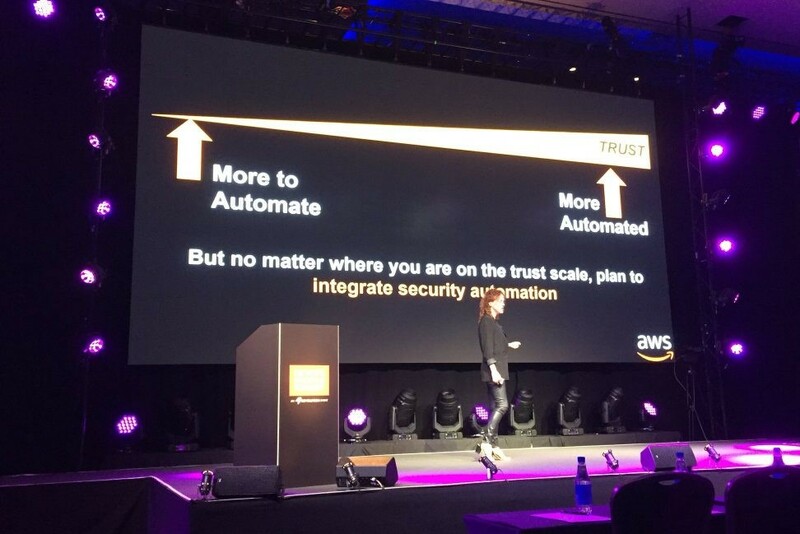 And coming from Amazon, she comes from a place of security automation experience. After all, AWS released almost 1,500 key features and new services in 2017. Amazon.com performs a production deployment of once every 11.6 seconds and an average of 10,000 hosts simultaneously. How does AWS and Amazon.com do DevOps but still retain core security practices? “If there was a security problem, it would make the evening news,” Cronin said. In the end, you can call it DevSecOps or Rugged IT like agile and kanban enthusiasts call it, but how AWS refers to it is pretty accurate: security automation at cloud scale. While a mistake is written into code or an automated process, these mistakes are frequently repeated, which creates patterns that are easily diagnosed. Machines don’t make mistakes, bend the rules, or act with malice, which is why Cronin argues that automating security tasks must be your biggest priority for successful DevOps. For this, she has what she calls her bar or spectrum of trust that you have in your cloud or on-premises provider. Cronin points out that large, distributed organizations with defined security processes and governance typically have low or zero trust. These low-trust companies want their own managed keys and their own hardware security modules. They are at one end of this spectrum. On the other end of this spectrum lies startups and e-commerce platforms that use all the services of their cloud service provider. “It doesn’t matter where you are in the spectrum, you can still get the value of the cloud, but the point of trust that you have is congruent to the amount of automation you need to implement,” she said. Cronin gave the example of transferring trust with more automation. This Trust Zero could be a company deploying native Kubernetes, managing the master nodes (scaling and distributed consensus), the worker nodes, and all the security. On the other end of the spectrum, at the right she offered an example where the customer with higher trust uses an AWS service called AWS Elastic Kubernetes Service. Here Cronin is referencing a common concern around Kubernetes, which has RBAC turned off by default. This is what happened last Spring to Tesla when someone was able to hack its control plane because nobody had enabled RBAC. By putting more trust into AWS’s Elastic Kubernetes, she says RBAC for Kubernetes is automatically turned on, has native integration with AWS, and managed master nodes. This involves mapping the tooling based on where you are on the illustrated trust bar. The lower level of trust, the higher the level of security automation the DevOps team needs to implement. The higher the level of trust, the more the cloud provider can automatically manage and automate for you. This impacts how quickly you are going to release your minimum viable product. Also the less trust, the more you have to plan your security ahead, like having to make sure your RBAC is on. Cronin contends that in DevSecOps, every team member feels the responsibility of a security owner — it’s no longer a team in another building just a stakeholder to your project. Just like DevOps tears down the silos between developers and operations, the same must happen for security. You then use the same dynamic CI/CD pipeline to roll out your security features at you would with the rest of your DevOps. Security by design also means having security-related acceptance criteria. Continuing with the example of GDPR’s requirements, which has a lot of prioritizing that users own their own data when a user logs into the system, you have demonstrated how that data can be deleted and demonstrate how you can actually port it over. Security automation has to test if that is possible and, ideally, document it all. Cronin says the example above and much of this security automation advice can be applied to on-premise as well, with both how to treat the security of — including access roles and hardening of build servers and nodes — and the security in — including artifact validation and static code analysis — your CI/CD pipeline. Cronin also spoke about Infrastructure as Code, moving away from the classic horizontal stages of Develop > Integration Test > User Acceptance Testing > Push to Production and towards the verticals of Networking, Security, Applications, Logging, and Monitoring. “Then if you believe a part of a stage is compromised, you can tear it down so quickly and then recover. You could take down the UAT [user acceptance testing] security block and leave the rest of UAT intact,” she said. This process of security automation combined with the vertical stages above becomes highly immutable and reduces your blast radius. When are you collecting logs? Why are you collecting logs? Where are you collecting logs? What are you doing based on your logs? Take the example of someone switching off an AWS Service. It can send an automated event to your security team for them to look into the environment. It allows you to make the decision if it was shut off by someone whose privileges are too high or if it’s actually an event that needs looking into and maybe servers need to be ring-fenced. Cronin pointed out how powerful logging has become and how logging in the cloud prevents more incidents. Photos: European DevOps Enterprise Summit Twitter.